Positions of known outer Solar System objects. The centaurs lie generally inwards of the Kuiper belt and outside the Jupiter trojans. Centaurs are small Solar System bodies with a semi-major axis between those of the outer planets. They generally have unstable orbits because they cross or have crossed the orbits of one or more of the giant planets; almost all their orbits have dynamic lifetimes of only a few million years, but there is one centaur, (514107) 2015 BZ509, which may be in a stable (though retrograde) orbit. Centaurs typically behave with characteristics of both asteroids and comets. 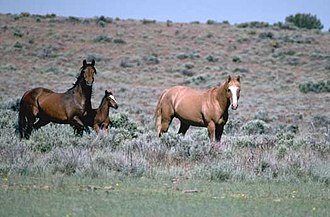 They are named after the mythological centaurs that were a mixture of horse and human. It has been estimated that there are around 44,000 centaurs in the Solar System with diameters larger than 1 kilometer. The first centaur to be discovered, under the definition of the Jet Propulsion Laboratory and the one used here, was 944 Hidalgo in 1920. However, they were not recognized as a distinct population until the discovery of 2060 Chiron in 1977. The largest confirmed centaur is 10199 Chariklo, which at 260 kilometers in diameter is as big as a mid-sized main-belt asteroid, and is known to have a system of rings. It was discovered in 1997. However, the lost centaur 1995 SN55 may be somewhat larger. No centaur has been photographed up close, although there is evidence that Saturn's moon Phoebe, imaged by the Cassini probe in 2004, may be a captured centaur that originated in the Kuiper belt. In addition, the Hubble Space Telescope has gleaned some information about the surface features of 8405 Asbolus. As of 2008[update], three centaurs have been found to display comet-like comas: 2060 Chiron, 60558 Echeclus, and 166P/NEAT. Chiron and Echeclus are therefore classified as both asteroids and comets. 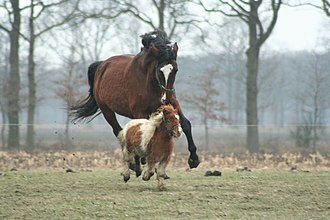 Other centaurs, such as 52872 Okyrhoe, are suspected of having shown comas. Any centaur that is perturbed close enough to the Sun is expected to become a comet. The generic definition of a centaur is a small body that orbits the Sun between Jupiter and Neptune and crosses the orbits of one or more of the giant planets. Due to the inherent long-term instability of orbits in this region, even centaurs such as 2000 GM137 and 2001 XZ255, which do not currently cross the orbit of any planet, are in gradually changing orbits that will be perturbed until they start to cross the orbit of one or more of the giant planets. The Minor Planet Center (MPC) defines centaurs as having a perihelion beyond the orbit of Jupiter (q > 5.2 AU) and a semi-major axis less than that of Neptune (a < 30.1 AU). Though nowadays the MPC often lists centaurs and scattered disc objects together as a single group. The Jet Propulsion Laboratory (JPL) similarly defines centaurs as having a semi-major axis, a, between those of Jupiter (5.5 AU < a) and Neptune (a < 30.1 AU). In contrast, the Deep Ecliptic Survey (DES) defines centaurs using a dynamical classification scheme. These classifications are based on the simulated change in behavior of the present orbit when extended over 10 million years. The DES defines centaurs as non-resonant objects whose instantaneous (osculating) perihelia are less than the osculating semi-major axis of Neptune at any time during the simulation. This definition is intended to be synonymous with planet-crossing orbits and to suggest comparatively short lifetimes in the current orbit. The collection The Solar System Beyond Neptune (2008) defines objects with a semi-major axis between those of Jupiter and Neptune and a Jupiter – Tisserand's parameter above 3.05 – as centaurs, classifying the objects with a Jupiter Tisserand's parameter below this and, to exclude Kuiper belt objects, an arbitrary perihelion cut-off half-way to Saturn (q < 7.35 AU) as Jupiter-family comets[note 1] and classifying those objects on unstable orbits with a semi-major axis larger than Neptune's as members of the scattered disc. Other astronomers prefer to define centaurs as objects that are non-resonant with a perihelion inside the orbit of Neptune that can be shown to likely cross the Hill sphere of a gas giant within the next 10 million years, so that centaurs can be thought of as objects scattered inwards and that interact more strongly and scatter more quickly than typical scattered-disc objects. The JPL Small-Body Database lists 452 centaurs. There are an additional 116 trans-Neptunian objects (objects with a semi-major axis further than Neptune's, i.e. a > 30.1 AU) with a perihelion closer than the orbit of Uranus (q < 19.2 AU). The Committee on Small Body Nomenclature of the International Astronomical Union has not formally weighed in on either side of the debate. Instead, it has adopted the following naming convention for such objects: Befitting their centaur-like transitional orbits between TNOs and comets, "objects on unstable, non-resonant, giant-planet-crossing orbits with semimajor axes greater than Neptune's" are to be named for other hybrid and shape-shifting mythical creatures. Thus far, only the binary objects Ceto and Phorcys and Typhon and Echidna have been named according to the new policy. Other objects caught between these differences in classification methods include 944 Hidalgo which was discovered in 1920 and is listed as a centaur in the JPL Small-Body Database. (44594) 1999 OX3, which has a semi-major axis of 32 AU but crosses the orbits of both Uranus and Neptune is listed as an outer centaur by the Deep Ecliptic Survey (DES). Among the inner centaurs, (434620) 2005 VD, with a perihelion distance very near Jupiter, is listed as a centaur by both JPL and DES. Centaurs with measured diameters listed as possible dwarf planets according to Mike Brown's website include 10199 Chariklo, (523727) 2014 NW65, 2060 Chiron, and 54598 Bienor. The diagram illustrates the orbits of known centaurs in relation to the orbits of the planets. For selected objects, the eccentricity of the orbits is represented by red segments (extending from perihelion to aphelion). The orbits of centaurs show a wide range of eccentricity, from highly eccentric (Pholus, Asbolus, Amycus, Nessus) to more circular (Chariklo and the Saturn-crossers Thereus and Okyrhoe). 2001 XZ255 has the lowest inclination (i < 3°). 2004 YH32 is one of a small proportion of centaurs with an extreme prograde inclination (i > 60°). It follows such a highly inclined orbit (79°) that, while it crosses from the distance of the asteroid belt from the Sun to past the distance of Saturn, if its orbit is projected onto the plane of Jupiter's orbit, it does not even go out as far as Jupiter. A dozen known centaurs follow retrograde orbits. Their inclinations range from modest (e.g., 160° for Dioretsa) to extreme (i < 120°; e.g. 105° for (342842) 2008 YB3). The semi-major axis of Asbolus during the next 5500 years, using two slightly different estimates of present-day orbital elements. After the Jupiter encounter of year 4713 the two calculations diverge. Because the centaurs are not protected by orbital resonances, their orbits are unstable within a timescale of 106–107 years. For example, 55576 Amycus is in an unstable orbit near the 3:4 resonance of Uranus. Dynamical studies of their orbits indicate that being a centaur is probably an intermediate orbital state of objects transitioning from the Kuiper belt to the Jupiter family of short-period comets. Objects may be perturbed from the Kuiper belt, whereupon they become Neptune-crossing and interact gravitationally with that planet (see theories of origin). They then become classed as centaurs, but their orbits are chaotic, evolving relatively rapidly as the centaur makes repeated close approaches to one or more of the outer planets. Some centaurs will evolve into Jupiter-crossing orbits whereupon their perihelia may become reduced into the inner Solar System and they may be reclassified as active comets in the Jupiter family if they display cometary activity. Centaurs will thus ultimately collide with the Sun or a planet or else they may be ejected into interstellar space after a close approach to one of the planets, particularly Jupiter. The relatively small size of centaurs precludes remote observation of surfaces, but colour indices and spectra can provide clues about surface composition and insight into the origin of the bodies. The colours of centaurs are very diverse, which challenges any simple model of surface composition. In the side-diagram, the colour indices are measures of apparent magnitude of an object through blue (B), visible (V) (i.e. green-yellow) and red (R) filters. The diagram illustrates these differences (in exaggerated colours) for all centaurs with known colour indices. For reference, two moons: Triton and Phoebe, and planet Mars are plotted (yellow labels, size not to scale). The colour difference reflects a different level of space-weathering from radiation and/or cometary activity. As examples of the second category, the reddish colour of Pholus has been explained as a possible mantle of irradiated red organics, whereas Chiron has instead had its ice exposed due to its periodic cometary activity, giving it a blue/grey index. The correlation with activity and color is not certain, however, as the active centaurs span the range of colors from blue (Chiron) to red (166P/NEAT). Alternatively, Pholus may have been only recently expelled from the Kuiper belt, so that surface transformation processes have not yet taken place. Delsanti et al. suggest multiple competing processes: reddening by the radiation, and blushing by collisions. The interpretation of spectra is often ambiguous, related to particle sizes and other factors, but the spectra offer an insight into surface composition. As with the colours, the observed spectra can fit a number of models of the surface. Chariklo's surface has been suggested to be a mixture of tholins (like those detected on Titan and Triton) with amorphous carbon. Pholus has been suggested to be covered by a mixture of Titan-like tholins, carbon black, olivine and methanol ice. The surface of 52872 Okyrhoe has been suggested to be a mixture of kerogens, olivines and small percentage of water ice. 8405 Asbolus has been suggested to be a mixture of 15% Triton-like tholins, 8% Titan-like tholin, 37% amorphous carbon and 40% ice tholin. Comet 38P exhibits centaur-like behavior by making close approaches to Jupiter, Saturn, and Uranus between 1982 and 2067. Chiron appears to be the most complex. The spectra observed vary depending on the period of the observation. Water ice signature was detected during a period of low activity and disappeared during high activity. Observations of Chiron in 1988 and 1989 near its perihelion found it to display a coma (a cloud of gas and dust evaporating from its surface). It is thus now officially classified as both a comet and an asteroid, although it is far larger than a typical comet and there is some lingering controversy. Other centaurs are being monitored for comet-like activity: so far two, 60558 Echeclus, and 166P/NEAT have shown such behavior. 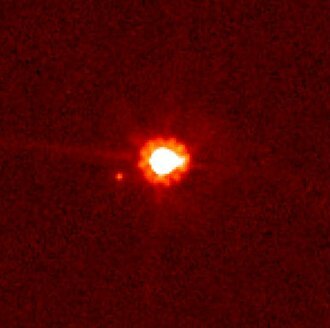 166P/NEAT was discovered while it exhibited a coma, and so is classified as a comet, though its orbit is that of a centaur. 60558 Echeclus was discovered without a coma but recently became active, and so it too is now classified as both a comet and an asteroid. Carbon monoxide has been detected in 60558 Echeclus and Chiron  in very small amounts, and the derived CO production rate was calculated to be sufficient to account for the observed coma. The calculated CO production rate from both 60558 Echeclus and Chiron is substantially lower than what is typically observed for 29P/Schwassmann–Wachmann, another distantly active comet often classified as a centaur. There is no clear orbital distinction between centaurs and comets. Both 29P/Schwassmann-Wachmann and 39P/Oterma have been referred to as centaurs since they have typical centaur orbits. The comet 39P/Oterma is currently inactive and was seen to be active only before it was perturbed into a centaur orbit by Jupiter in 1963. The faint comet 38P/Stephan–Oterma would probably not show a coma if it had a perihelion distance beyond Jupiter's orbit at 5 AU. By the year 2200, comet 78P/Gehrels will probably migrate outwards into a centaur-like orbit. A periodogram analysis of the light-curves of these Chiron and Chariklo gives respectively the following rotational periods: 5.5±0.4~h and 7.0± 0.6~h. The study of centaur development is rich in recent developments, but any conclusions are still hampered by limited physical data. Different models have been put forward for possible origin of centaurs. Simulations indicate that the orbit of some Kuiper belt objects can be perturbed, resulting in the object's expulsion so that it becomes a centaur. Scattered disc objects would be dynamically the best candidates (For instance, the centaurs could be part of an "inner" scattered disc of objects perturbed inwards from the Kuiper belt.) for such expulsions, but their colours do not fit the bicoloured nature of the centaurs. Plutinos are a class of Kuiper belt object that display a similar bicoloured nature, and there are suggestions that not all plutinos' orbits are as stable as initially thought, due to perturbation by Pluto. Further developments are expected with more physical data on Kuiper belt objects. ^ the class is defined by the perihelion and aphelion distance of the object: S indicates a perihelion/aphelion near Saturn, U near Uranus, N near Neptune, and K in the Kuiper belt. ^ This would make Echeclus (q = 5.8 AU, TJ = 3.03) and Okyrhoe (q = 5.8 AU; TJ = 2.95), which have traditionally been classified as centaurs, and Hidalgo (q = 1.95 AU; TJ = 2.07), which has traditionally been considered an asteroid and is classified as a centaur by JPL, Jupiter-family comets, not centaurs. ^ a b c d e Horner, J.; Evans, N.W. ; Bailey, M. E. (2004). "Simulations of the Population of Centaurs I: The Bulk Statistics". Monthly Notices of the Royal Astronomical Society. 354 (3): 798–810. arXiv:astro-ph/0407400. Bibcode:2004MNRAS.354..798H. doi:10.1111/j.1365-2966.2004.08240.x. ^ Fathi Namouni and Maria Helena Moreira Morais (May 2, 2018). "An interstellar origin for Jupiter's retrograde co-orbital asteroid". Monthly Notices of the Royal Astronomical Society. arXiv:1805.09013. Bibcode:2018MNRAS.477L.117N. doi:10.1093/mnrasl/sly057. For criticism of this idea see Billings, Lee (21 May 2018). "Astronomers Spot Potential "Interstellar" Asteroid Orbiting Backward around the Sun". Scientific American. Retrieved 1 June 2018. ^ Jewitt, David; Haghighipour, Nader (2007). "Irregular Satellites of the Planets: Products of Capture in the Early Solar System" (PDF). Annual Review of Astronomy and Astrophysics. 45: 261–95. arXiv:astro-ph/0703059. Bibcode:2007ARA&A..45..261J. doi:10.1146/annurev.astro.44.051905.092459. Archived from the original (PDF) on 2010-02-07. ^ "Unusual Minor Planets". Minor Planet Center. Retrieved 2010-10-25. ^ "Orbit Classification (Centaur)". JPL Solar System Dynamics. Retrieved 2008-10-13. ^ Elliot, J.L. ; Kern, S. D.; Clancy, K. B.; Gulbis, A. A. S.; Millis, R. L.; Buie, M. W.; Wasserman, L. H.; Chiang, E. I.; Jordan, A. B.; Trilling, D. E.; Meech, K. J. (2005). "The Deep Ecliptic Survey: A Search for Kuiper Belt Objects and Centaurs. II. Dynamical Classification, the Kuiper Belt Plane, and the Core Population". The Astronomical Journal. 129 (2): 1117–1162. Bibcode:2005AJ....129.1117E. doi:10.1086/427395. Retrieved 2008-09-22. ^ Gladman, B.; Marsden, B.; Van Laerhoven, C. (2008). "Nomenclature in the Outer Solar System" (PDF). The Solar System Beyond Neptune. ISBN 978-0-8165-2755-7. ^ Chaing, Eugene; Lithwick, Y.; Murray-Clay, R.; Buie, M.; Grundy, W.; Holman, M. (2007). Reipurth, B.; Jewitt, D.; Keil, K., eds. "A Brief History of Transneptunian Space". Protostars and Planets V. University of Arizona Press, Tucson: 895–911. arXiv:astro-ph/0601654. Bibcode:2007prpl.conf..895C. ^ "JPL Small-Body Database Search Engine: List of centaurs". JPL Solar System Dynamics. Retrieved 2018-10-11. ^ "JPL Small-Body Database Search Engine: List of TNOs with perihelia closer than Uranus's orbit". JPL Solar System Dynamics. Retrieved 2018-10-11. ^ Grundy, Will; Stansberry, J.A. ; Noll, K; Stephens, D.C.; Trilling, D.E. ; Kern, S.D. ; Spencer, J.R.; Cruikshank, D.P. ; Levison, H.F. (2007). "The orbit, mass, size, albedo, and density of (65489) Ceto/Phorcys: A tidally-evolved binary Centaur". Icarus. 191 (1): 286–297. arXiv:0704.1523. Bibcode:2007Icar..191..286G. doi:10.1016/j.icarus.2007.04.004. ^ Brown, Michael E. "How many dwarf planets are there in the outer solar system? (updates daily)". California Institute of Technology. Retrieved 18 November 2016. ^ C. de la Fuente Marcos; R. de la Fuente Marcos (2014). "Large retrograde Centaurs: visitors from the Oort cloud?". Astrophysics and Space Science. 352/2: 409–419. arXiv:1406.1450. doi:10.1007/s10509-014-1993-9. ^ Barucci, M. A.; Doressoundiram, A.; Cruikshank, D. P. (2003). "Physical Characteristics of TNOs and Centaurs" (PDF). Laboratory for Space Studies and Astrophysics Instrumentation, Paris Observatory. Archived from the original (PDF) on 29 May 2008. Retrieved 20 March 2008. ^ Peixinho, N.; Doressoundiram, A.; Delsanti, A.; Boehnhardt, H.; Barucci, M. A.; Belskaya, I. (2003). "Reopening the TNOs Color Controversy: Centaurs Bimodality and TNOs Unimodality". Astronomy and Astrophysics. 410 (3): L29–L32. arXiv:astro-ph/0309428. Bibcode:2003A&A...410L..29P. doi:10.1051/0004-6361:20031420. ^ A class of Magnesium Iron Silicates (Mg, Fe)2SiO4, common components of igneous rocks. ^ "JPL Close-Approach Data: 38P/Stephan-Oterma". NASA. 1981-04-04. last obs. Retrieved 2009-05-07. ^ Dotto, E; Barucci, M A; De Bergh, C (June 2003). "Colours and composition of the centaurs". Earth, Moon, and Planets. 92 (1–4): 157–167. Bibcode:2003EM&P...92..157D. doi:10.1023/b:moon.0000031934.89097.88. ^ Luu, Jane X.; Jewitt, David; Trujillo, C. A. (2000). "Water Ice on 2060 Chiron and its Implications for Centaurs and Kuiper Belt Objects". The Astrophysical Journal. 531 (2): L151–L154. arXiv:astro-ph/0002094. Bibcode:2000ApJ...531L.151L. doi:10.1086/312536. PMID 10688775. ^ Fernandez, Y. R.; Jewitt, D. C.; Sheppard, S. S. (2002). "Thermal Properties of Centaurs Asbolus and Chiron". The Astronomical Journal. 123 (2): 1050–1055. arXiv:astro-ph/0111395. Bibcode:2002AJ....123.1050F. doi:10.1086/338436. ^ Choi, Y-J. ; Weissman, P.R. ; Polishook, D. (January 2006). "(60558) 2000 EC_98". IAU Circ. (8656): 2. ^ Wierzchos, K.; Womack, M.; Sarid, G. (2017). "Carbon Monoxide in the Distantly Active Centaur (60558) 174P/Echeclus at 6 au". The Astronomical Journal. 153 (5): 8. arXiv:1703.07660. Bibcode:2017AJ....153..230W. doi:10.3847/1538-3881/aa689c. ^ Womack, M.; Stern, A. (1999). "Observations of Carbon Monoxide in (2060) Chiron" (PDF). Lunar and Planetary Science XXVIII. Retrieved 2017-07-11. ^ a b Galiazzo, M. A.; de la Fuente Marcos, C.; de la Fuente Marcos, R.; Carraro, G.; Maris, M.; Montalto, M. (2016). "Photometry of Centaurs and trans-Neptunian objects: 2060 Chiron (1977 UB), 10199 Chariklo (1997 CU26), 38628 Huya (2000 EB173), 28978 Ixion (2001 KX76), and 90482 Orcus (2004 DW)". Astrophysics and Space Science. 361 (3): 212–218. arXiv:1605.08251. Bibcode:2016Ap&SS.361..212G. doi:10.1007/s10509-016-2801-5. ^ Galiazzo, M. A.; Wiegert, P. & Aljbaae, S. (2016). "Influence of the Centaurs and TNOs on the main belt and its families". Astrophysics and Space Science. 361 (12): 361–371. arXiv:1611.05731. Bibcode:2016Ap&SS.361..371G. doi:10.1007/s10509-016-2957-z. ^ Stein, Zane B. (2008). "What are the Centaurs?". zanestein.com. ^ Wan, X.-S.; Huang, T.-Y. (2001). "The orbit evolution of 32 plutinos over 100 million years". Astronomy and Astrophysics. 368 (2): 700–705. Bibcode:2001A&A...368..700W. doi:10.1051/0004-6361:20010056. 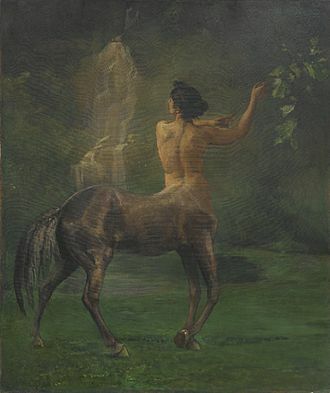 Wikimedia Commons has media related to Centaurs (minor planets). Horner, Jonathan; Lykawka, Patryk Sofia (2010). "Planetary Trojans – the main source of short period comets?". International Journal of Astrobiology. 9 (4): 227–234. arXiv:1007.2541. Bibcode:2010IJAsB...9..227H. doi:10.1017/S1473550410000212. In astronomy, a resonant trans-Neptunian object is a trans-Neptunian object in mean-motion orbital resonance with Neptune. The orbital periods of the resonant objects are in a simple integer relations with the period of Neptune e. g.1,2,2,3 etc, resonant TNOs can be either part of the main Kuiper belt population, or the more distant scattered disc population. The diagram illustrates the distribution of the known trans-Neptunian objects, resonant objects are plotted in red. The designation 2,3 or 3,2 both refer to the resonance for TNOs. There is no ambiguity, because TNOs have, by definition, the usage depends on the author and the field of research. Detailed analytical and numerical studies of Neptune’s resonances have shown that the objects must have a precise range of energies. If the objects semi-major axis is outside these ranges, the orbit becomes chaotic. As TNOs were discovered, more than 10% were found to be in 2,3 resonances and it is now believed that the objects have been collected from wider distances by sweeping resonances during the migration of Neptune. During this relatively short period of time, Neptunes resonances would be sweeping the space, the 2,3 resonance at 39.4 AU is by far the dominant category among the resonant objects, with 92 confirmed and 104 possible member bodies. The objects following orbits in this resonance are named plutinos after Pluto, the objects are rather small and most of them follow orbits close to the ecliptic. Twotinos have inclinations less than 15 degrees and generally moderate eccentricities, there are far fewer objects in this resonance than plutinos. Consequently, it might be that twotinos were originally as numerous as plutinos and these Neptune trojans, termed by analogy to the Trojan asteroids, are in 1,1 resonance with Neptune. One of the concerns is that weak resonances may exist and would be difficult to due to the current lack of accuracy in the orbits of these distant objects. Many objects have orbital periods of more than 300 years and most have only observed over a short observation arc of a couple years. 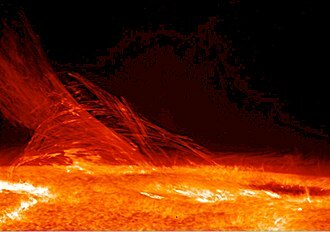 A comet is an icy small Solar System body that, when passing close to the Sun and begins to evolve gasses, a process called outgassing. This produces an atmosphere or coma, and sometimes a tail. These phenomena are due to the effects of radiation and the solar wind acting upon the nucleus of the comet. Comet nuclei range from a few hundred metres to tens of kilometres across and are composed of collections of ice, dust. The coma may be up to 15 times the Earths diameter, if sufficiently bright, a comet may be seen from the Earth without the aid of a telescope and may subtend an arc of 30° across the sky. Comets have been observed and recorded since ancient times by many cultures, Comets usually have highly eccentric elliptical orbits, and they have a wide range of orbital periods, ranging from several years to potentially several millions of years. 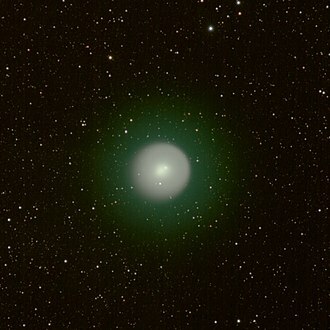 Short-period comets originate in the Kuiper belt or its associated scattered disc, long-period comets are thought to originate in the Oort cloud, a spherical cloud of icy bodies extending from outside the Kuiper belt to halfway to the nearest star. Long-period comets are set in motion towards the Sun from the Oort cloud by gravitational perturbations caused by passing stars, hyperbolic comets may pass once through the inner Solar System before being flung to interstellar space. The appearance of a comet is called an apparition, Comets are distinguished from asteroids by the presence of an extended, gravitationally unbound atmosphere surrounding their central nucleus. This atmosphere has parts termed the coma and the tail, extinct comets that have passed close to the Sun many times have lost nearly all of their volatile ices and dust and may come to resemble small asteroids. 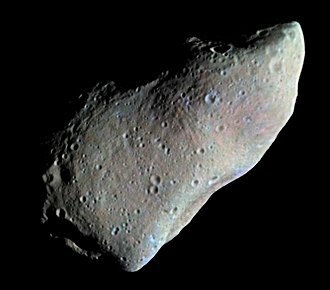 Asteroids are thought to have a different origin from comets, having formed inside the orbit of Jupiter rather than in the outer Solar System, the discovery of main-belt comets and active centaur minor planets has blurred the distinction between asteroids and comets. As of November 2014 there are 5,253 known comets, this represents only a tiny fraction of the total potential comet population, as the reservoir of comet-like bodies in the outer Solar System is estimated to be one trillion. In astronomy, perturbation is the complex motion of a massive body subject to forces other than the gravitational attraction of a single other massive body. The other forces can include a body, resistance, as from an atmosphere. The study of perturbations began with the first attempts to predict planetary motions in the sky, in ancient times the causes were a mystery. Newton, at the time he formulated his laws of motion and of gravitation, applied them to the first analysis of perturbations, the complex motions of gravitational perturbations can be broken down. The hypothetical motion that the body follows under the effect of one other body only is typically a conic section. This is called a problem, or an unperturbed Keplerian orbit. The differences between that and the motion of the body are perturbations due to the additional gravitational effects of the remaining body or bodies. If there is one other significant body the perturbed motion is a three-body problem. A general analytical solution exists for the problem, when more than two bodies are considered analytic solutions exist only for special cases. Even the two-body problem becomes insoluble if one of the bodies is irregular in shape, most systems that involve multiple gravitational attractions present one primary body which is dominant in its effects. The gravitational effects of the bodies can be treated as perturbations of the hypothetical unperturbed motion of the planet or satellite around its primary body. In methods of general perturbations, general differential equations, either of motion or of change in the elements, are solved analytically, usually by series expansions. The result is expressed in terms of algebraic and trigonometric functions of the orbital elements of the body in question. This can be applied generally to many different sets of conditions, general perturbations were investigated first. The classical methods are known as variation of the elements, variation of parameters or variation of the constants of integration, in these methods, it is considered that the body is always moving in a conic section, however the conic section is constantly changing due to the perturbations. The scattered disc is a distant circumstellar disc in the Solar System that is sparsely populated by icy minor planets, a subset of the broader family of trans-Neptunian objects. The scattered-disc objects have orbital eccentricities ranging as high as 0.8, inclinations as high as 40° and these extreme orbits are thought to be the result of gravitational scattering by the gas giants, and the objects continue to be subject to perturbation by the planet Neptune. 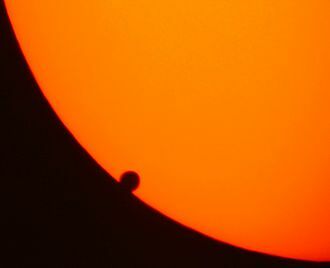 Although the closest scattered-disc objects approach the Sun at about 30–35 AU and this makes scattered objects among the most distant and coldest objects in the Solar System. 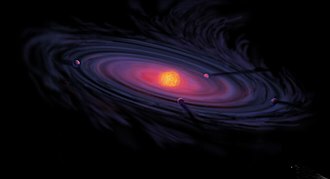 Eventually, perturbations from the giant planets send such objects towards the Sun, many Oort cloud objects are thought to have originated in the scattered disc. Detached objects are not sharply distinct from scattered disc objects, during the 1980s, the use of CCD-based cameras in telescopes made it possible to directly produce electronic images that could be readily digitized and transferred to digital images. Because the CCD captured more light than film and the blinking could now be done at a computer screen. A flood of new discoveries was the result, over a thousand objects were detected between 1992 and 2006. The first scattered-disc object to be recognised as such was 1996 TL66, three more were identified by the same survey in 1999,1999 CV118,1999 CY118, and 1999 CF119. The first object presently classified as an SDO to be discovered was 1995 TL8, as of 2011, over 200 SDOs have been identified, including 2007 UK126,2002 TC302, Sedna and 2004 VN112. Known trans-Neptunian objects are divided into two subpopulations, the Kuiper belt and the scattered disc. A third reservoir of trans-Neptunian objects, the Oort cloud, has been hypothesized, some researchers further suggest a transitional space between the scattered disc and the inner Oort cloud, populated with detached objects. Those in 3,2 resonances are known as plutinos, because Pluto is the largest member of their group, in contrast to the Kuiper belt, the scattered-disc population can be disturbed by Neptune. 2060 Chiron, known as 95P/Chiron, is a minor planet in the outer Solar System, orbiting the Sun between Saturn and Uranus. Discovered in 1977 by Charles T. Kowal, it was the member of a new class of objects now known as centaurs—bodies orbiting between the asteroid belt and the Kuiper belt. Besides the four giant planets, Chiron and 10199 Chariklo, a centaur, are the other bodies in the Solar System known to have rings. Although it was called an asteroid and classified only as a minor planet with the designation 2060 Chiron. Today it is classified as both a planet and a comet, and is accordingly known by the cometary designation 95P/Chiron. Chiron is named after the centaur Chiron in Greek mythology, michael Brown lists it as possibly a dwarf planet with a measured diameter of 206 km which is near the lower limit for an icy dwarf planet. Chiron was discovered on 1 November 1977 by Charles Kowal from images taken on 18 October at Palomar Observatory and it was given the temporary designation of 1977 UB. It was found near aphelion and at the time of discovery it was the most distant known minor planet, Chiron was even claimed as the tenth planet by the press. Chiron was found on several images, going back to 1895. It had been at perihelion in 1945 but was not discovered because there were few searches being made at time. The Lowell Observatorys survey for distant planets would not have gone down faint enough in the 1930s and it was named Chiron in 1979 after Chiron, one of the centaurs, it was suggested that the names of other centaurs be reserved for objects of the same type. Chirons orbit was found to be eccentric, with perihelion just inside the orbit of Saturn. According to the program Solex, Chirons closest approach to Saturn in modern times was around May 720, during this passage Saturns gravity caused Chirons semi-major axis to decrease from 14. 55±0.12 AU to 13.7 AU. It does not come nearly as close to Uranus, Chiron crosses Uranuss orbit where the latter is farther than average from the Sun, Chiron attracted considerable interest because it was the first object discovered in such an orbit, well outside the asteroid belt. A sednoid is a trans-Neptunian object with a perihelion greater than 50 AU and a semi-major axis greater than 150 AU. Only two objects are known from this population,90377 Sedna and 2012 VP113, both of which have greater than 75 AU, but it is suspected that there are many more. These objects lie outside an apparently nearly empty gap in the Solar System starting at about 50 AU and they are usually grouped with the detached objects. The sednoids orbits cannot be explained by perturbations from the giant planets and their orbits could have been disrupted by an as-yet-unknown planet-sized body beyond the Kuiper belt such as the hypothesized Planet Nine. 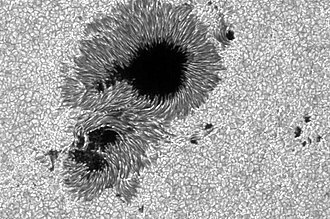 They could have captured from around passing stars, most likely in the Suns birth cluster. The two sednoids, like all of the more extreme detached objects, have an orientation of ≈ 0°.5 Gyr for Sedna. This suggests that one or more undiscovered massive perturbers may exist in the outer Solar System, a super-Earth at 250 AU would cause these objects to librate around ω = 0°±60° for billions of years. There are multiple possible configurations and a low-albedo super-Earth at that distance would have an apparent magnitude below the current all-sky-survey detection limits and this hypothetical super-Earth has been dubbed Telisto and Planet Nine. Larger, more-distant perturbers would be too faint to be detected, fourteen known objects have a semi-major axis greater than 150 AU, a perihelion beyond Neptune, an argument of perihelion of 340°±55°, and an observation arc of more than 1 year. Each of the mechanisms for Sednas extreme orbit would leave a distinct mark on the structure. 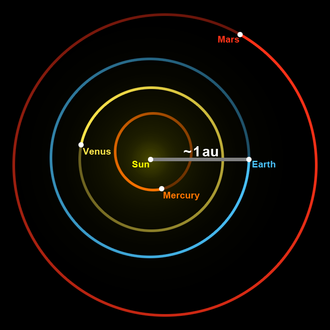 If a trans-Neptunian planet was responsible, all such objects would share roughly the same perihelion, if it rotated in the opposite direction, two populations would form, one with low and one with high inclinations. The perturbations from passing stars would produce a variety of perihelia and inclinations, each dependent on the number. Acquiring a larger sample of objects would therefore help in determining which scenario is most likely. A plutoid or ice dwarf is a trans-Neptunian dwarf planet, i. e. a body orbiting beyond Neptune that is massive enough to be rounded in shape. The term plutoid was adopted by the International Astronomical Union working group Committee on Small Bodies Nomenclature, the term plutoid is not widely used by astronomers, though ice dwarf is not uncommon. There are thought to be thousands of plutoids in the Solar System, the IAU developed this category of astronomical objects as a consequence of its 2006 resolution defining the word planet. 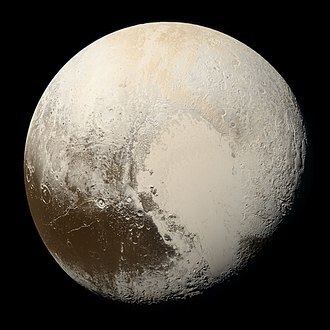 Satellites of plutoids are not plutoids themselves, on 24 August 2006, the IAU decided to reclassify Pluto as a dwarf planet, requiring that a planet must clear the neighbourhood around its orbit. The General Assembly of the IAU further resolved, Pluto is recognized as the prototype of a new category of Trans-Neptunian Objects and this new category had been proposed under the name pluton or a plutonian object earlier in the General Assembly. The former was rejected, in part because pluton is a geological term, the definition of the category fluctuated during its early stages. Ultimately, the final resolution left the definition, like the name. 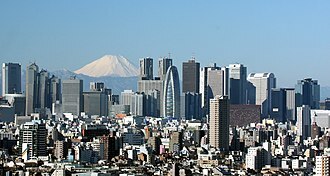 The term was announced after the Executive Committee meeting, along with a simplified definition. However, due to an error, the IAU Working Group for Planetary System Nomenclature was not consulted. As of 2009, the term had not been accepted by the scientific community. Prior to the emergence of the term plutoid as an IAU-sanctioned categorization, the term ice dwarf saw some adoption as a near-synonym to the eventual term plutoid. There are large numbers of objects in the Oort cloud. 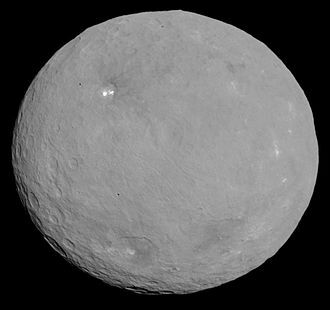 However, it is not clear whether all so-categorized ice dwarfs are actually icier than icy asteroids such as Ceres, Ceres is sometimes called a terrestrial dwarf to distinguish it from Pluto and Eris. This conception foreshadowed the reclassification of Pluto to dwarf planet and plutoid after the discovery of Eris, with the creation of the term dwarf planet, some ambiguity was created as to which of two IAU bodies would be responsible for naming dwarf planets. It has four very large satellites. 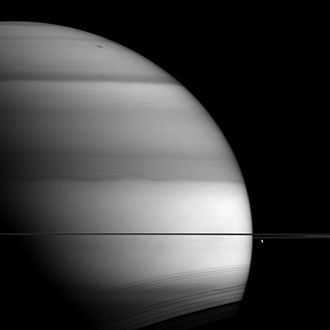 Saturn is the second-largest planet, with a large and bright ring system, Uranus is the third-largest planet and the least massive of the four outer planets. 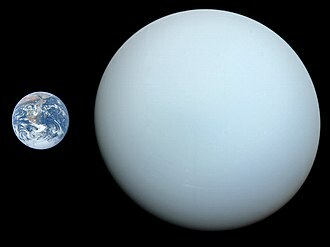 It is tilted almost onto the plane of its orbit, neptune is the fourth-largest planet, as smallest of the four outer planets, but third-most massive. It has one big retrograde moon and many small ones, the outer planets all have ring systems, although all but Saturns are faint when viewed from Earth. Another aspect common to the gas giants is their natural satellites. That pair and Io, Callisto and Triton, are larger than Pluto and this region of space is occupied by centaurs, various fields of trojans, and many comets. Pluto was considered to be a planet from its discovery in 1930 until its reclassification as a dwarf planet in 2006. In situ exploration by spacecraft includes Pioneer 10, Pioneer 11, Voyager 1, Voyager 2, Galileo, Cassini–Huygens, planned missions include Juno Jupiter Orbiter and possibly the Outer Planet Flagship Missions, there are various proposals too, such as Uranus orbiter and probe. Debris discs around the stars HD 139664 and HD 53143 – black circle from camera hides star to display discs. These cut-aways illustrate interior models of the giant planets. Jupiter is shown with a rocky core overlaid by a deep layer of metallic hydrogen. An artist's conception of 79 Ceti b, the first extrasolar giant planet found with a minimum mass less than Saturn. "Battle of Centaurs and Wild Beasts" was made for the dining room of Hadrian's Villa and estimated to be made between 120-130 A.D. The mosaic now resides in the Staatliche Museen zu Berlin in Germany. 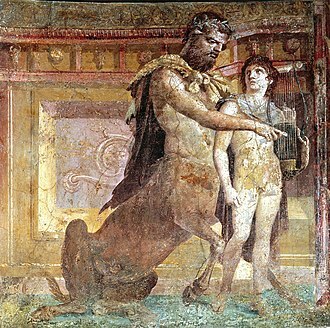 Chiron teaching Achilles how to play the lyre, a Roman fresco from Herculaneum, 1st century AD. Conic sections describe the possible orbits (yellow) of small objects around the Earth. A projection of these orbits onto the gravitational potential (blue) of the Earth makes it possible to determine the orbital energy at each point in space. The Galileo Probe plunged deep into Jupiter in 1995. It was carried to the Jovian system by the Galileo spacecraft, where it was released and survived what was then the highest-velocity atmospheric entry yet attempted. 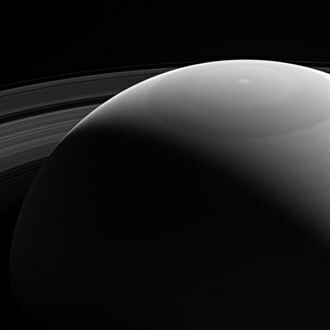 Chiron in Celestia with rings. Surface details and shape are imaginary, as it may not be in hydrostatic equilibrium.